Skippy and Pingu: Time to close this one now. 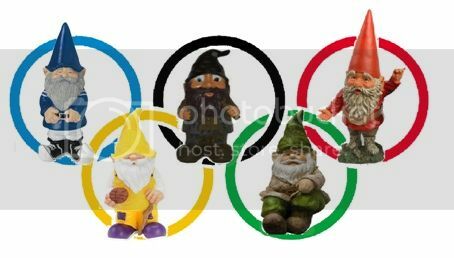 A little bit of friendly competition between the good gnomes of Wirral, Cheshire and any other unknown gnome trusts or societies. At Norley Village Hall, 1pm to 4pm. Thank you to Norley Village Hall committee for kindly hiring the hall to us free of charge. The Gnome Games will be an afternoon of fun and of course games . We hope this will be an annual event and will facilitate friendly rivalry between these 2 gnome organisations (and any others that might not wish to make themselves known) rather than risking more bloody rivalry as occurred at GNOMEAGEDON (documented by SirPhilPamAndRob). The winning group will win The Ashes (the remains of the first Gnome King's pointy hat). The afternoon will kick off with procession of the team flags, led by the respective presidents. Then every team respresentative will have the opportunity to register their times and distances for each event to determine who will represent each team in the finals. The finals will commence at 3pm sharp with the awards ceremony taking place shortly after the final event. There will be individual medals and an overall team winner who will be awarded with The Ashes. To add to the afternoon of fun there will be "From My Kitchen", "From My Garden" and "By My Hands" competitions run by the Ddraig Minions. Any items you wish to donate to the Ddraig Minions to sell after the competition will be gratefully received. From My Kitchen is any item you have cooked / baked. These will be judged on taste. From My Garden is any item you have grown in the garden. These will be judged on look. By My Hands is any item you have made. These will be judged on look. The Ddraig Minions will also be providing a selection of refreshments, stalls, a tombola, face painting, scarecrow making, and much more giving it a summer fair feeling. When you register your "will attend" please confirm your allegance (Wirral, Cheshire or Other). Wirral will be competing in red, Cheshire will be competing in blue and Others in yellow. Jurer nyy gur jurryoneebjf ner!